What Day Of The Week Is November 18? 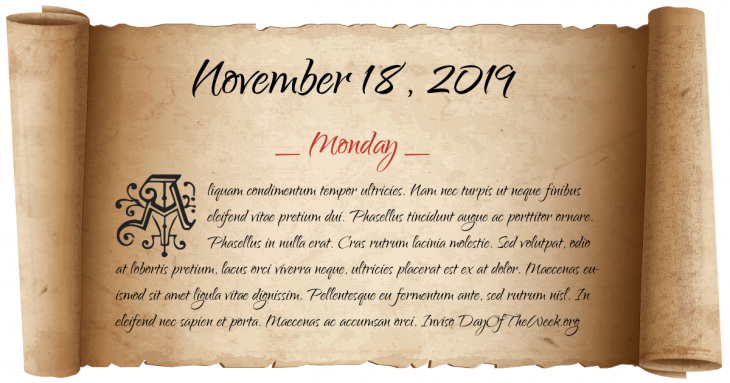 November 18, 2019 is the 322nd day of the year 2019 in the Gregorian calendar. There are 43 days remaining until the end of the year. The day of the week is Monday. King Christian IX of Denmark decides to sign the November constitution that declares Schleswig to be part of Denmark. This is seen by the German Confederation as a violation of the London Protocol and leads to the German–Danish war of 1864. American and Canadian railroads institute five standard continental time zones, ending the confusion of thousands of local times. The Hay-Bunau-Varilla Treaty is signed by the United States and Panama, giving the United States exclusive rights over the Panama Canal Zone. In Jonestown, Guyana, Jim Jones led his Peoples Temple cult to a mass murder-suicide that claimed 918 lives in all, 909 of them in Jonestown itself, including over 270 children. Congressman Leo J. Ryan is murdered by members of the Peoples Temple hours earlier. After an 87-day siege, the Croatian city of Vukovar capitulates to the besieging Yugoslav People’s Army and allied Serb paramilitary forces. Who were born on November 18?